Poisoned Pen Press, 9781590586174, 298pp. When his wife dies of ovarian cancer, Russell Mullins quits the Secret Service to repurpose his life. He joins a Washington D.C. private protection company and is assigned to guard Paul Luguire, a Federal Reserve executive and its chief liaison with the U.S. Treasury.Mullins and Luguire form a strong friendship. So when a police detective calls in the middle of the night with word of Luguire's suicide, Mullins doesn't buy it. His doubts are reinforced by Amanda Church, a former Secret Service colleague now in the Federal Reserve's cyber-security unit. She uncovered a suspicious financial transaction initiated by Luguire only days before his death. He authorized unrequested funds to be transferred from the Federal Reserve to a regional bank.Even stranger, after Luguire's suicide, Amanda finds the transaction has been erased from Federal Reserve records. The regional bank now shows the money wired from an offshore account in the name of Russell Mullins. Someone is setting Rusty up. And when the bank president is murdered, Mullins rockets to the top of the suspect list. As a tenacious reporter develops leads, Mullins follows a conspiratorial trail of killing and kidnapping that leads from a shadowy mastermind to the possible destruction of America's financial system.In an age of Wall Street meltdowns and downgrading of the U.S. credit rating, the secretive Federal Reserve has a pivotal role. Twelve targets are known. The clock is ticking. 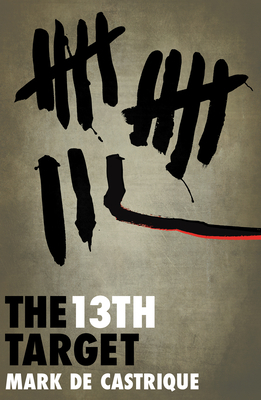 What, or who, is the thirteenth? Mark de Castrique grew up in the mountains of western North Carolina where his mysteries are set. Mark is a veteran of the television and film production industry, and he serves as an adjunct professor at the University of North Carolina at Charlotte.